"Empty Nesters" are discovering they can downsize by moving to a more affordable single-story home near the golf course. They may qualify for important tax benefits, such as capital gain exclusions on the sale of their principle residence, and transfer of the base-year value for their property tax, as allowed under Proposition 60. Oaks North is a popular option for empty nesters who are looking to downsize in a beautiful golf course community. Oaks North is one of the popular 55+ communities in Rancho Bernardo. It surrounds the 27 hole executive golf course, and offers affordable homes for seniors. Many of the homes are single-story with 2 or 3 bedrooms and easy to care for patios. Shown here is the Seven Oaks Community Center. It is loaded with features including heated swimming pool, library, auditorium with stage, meeting and activity rooms, a full-featured wood working shop, shuffle board, and others. 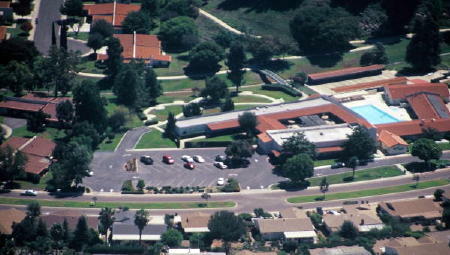 It is in close proximity to shops and restaurants, and the center of Rancho Bernardo. 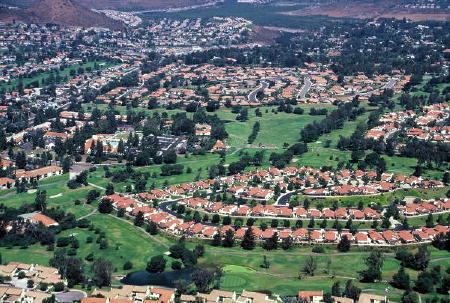 Seven Oaks is the largest 55+ community in Rancho Bernardo. This is a walkable community, and some of the best home prices in the entire area are found in Seven Oaks. There´s an important Property Tax benefit that can save thousands of dollars for Seniors who are planning to downsize to a smaller home. Commonly known as "Prop 60 and Prop 90", the County Assessor describes it as "the Reappraisal Exclusion Program for Senior Citizens". Suppose your children have grown and moved away, but you´re still living in the large family home. It´s getting more difficult to clean and climb the stairs each day. You´re thinking about a smaller one-story home on the golf course, and you could benefit from the extra cash that would be left over from the sale. But, you´re worried about your Property Taxes being reappraised at the sales price of the new home. This program provides one-time property tax relief for seniors over 55 by preventing a property valuation increase when the home is sold and another one purchased at equal or lesser value. There are some restrictions, and not everyone will qualify, but for many downsizing seniors it can save thousands of dollars in property taxes for years to come. For some important information about Proposition 60 and Proposition 90, here are some links to some details from the County Tax Assessor. The first link gives an overview with some questions and answers from the County Tax Assessor´s webpage. The second link is the application form, and the second page (the back of the form) has some more details about the rules and regulations. Of particular note, is that if you buy before you sell, the new price must be equal or less than the sold price. But, if you sell first, and then buy within the first year, you can go up to 105% of the sold price. And if you buy after the first year, but within the second year, then you can go up to 110% of the sold price. Beyond that, they are very strict on the guidelines. If you'd like to know more about this important Property Tax Program, or if you'd like to look at some homes that would be good options for downsizing, please give me a call at (858) 674-1222. I'll look forward to hearing from you.